This article examines location-based media projects implemented in selected Polish cities by local governments. We scrutinize the uses of the media, not only on the level of the end user, but as a certain tool in discursive efforts to assure a “modern” identity of the involved cities. Thus, we see these projects in broader social and cultural contexts. Drawing from Frederick Jameson's critical method, we investigate the consequences of them for human experience in urban surroundings and the imaginary struggles for modernity in the situated context of Poland. Substantial background for our claims is a long term, extensive multi-sited, situational ethnography and discourse analysis, triangulating the data related to the implementation of the said projects and relevant discursive resonance in media coverage. We argue that geolocation in Polish cities constitutes a technological substitute for lost cognitive mapping capacities and self-assurance of being modern. Moreover, it appears to be a kind of symbolic act re-presenting cultural contradictions and frictions on a subjective level as well as on an institutional one. In recent years Polish cities have experienced a huge wave of projects introducing location-based new media, also known as locative media, into urban spaces. A vast majority of them were funded by city councils and local city officials. The projects were either heavily affected by post-state-socialism transformation and the subsequent implementation of neoliberal policies, or they were initiated by small urban centers desperately striving for broader recognition. Both cases bear significant traces of certain identity struggle – local municipal governments are waging heavy battles to build better images for their cities. For instance, in Lodz, Katowice, Rybnik or Wodzislaw Slaski various tourist information systems were introduced, drawing abundantly from recent location-based media and augmented reality technologies such as 2-d codes, GPS, Location Based Social Networks, and others. These projects were develop in particular institutional contexts, and seemed to be directed to other purposes that either direct commercial utility or even basic user-assistance. Their implementation was intensively exposed to the public in local media coverage and discursive productions of the city councils themselves. Therefore, we study these media in context, as part of broader social and cultural deployments. Moreover, we focus on locality as a general cognitive form and frame of experiential reference, as well as a very real, material neighborhood (polis and metapolis). We understand location-based media as any digital resources that can be connected with physical locations and objects – generally making use of geographical position (see Wikipedia – which we find reliable source in such problematic field, as a kind of crowd-sourced definition collecting device, see also Tuters and Varnelis, 2008 or Lapenta 2011). As The Center for Locative Media aptly puts it, we can use this term when media are contextualized with location. Using an extensive, albeit long term, unstructured, multi-sited ethnography of this process, we investigate it rather as a cultural phenomenon. Therefore, we look at institutional contexts, imaginary struggles in which location-based media began to be a weapon, at strivings for being modern and for the recognition of cities as legitimate and successful subjects of modernization, and last but not least at the role of these projects in the collective imaginaries of Polish city-dwellers. Moreover, we focus on the issues of the construction of a new mode of urban experience, of the cognitive mapping of social space and, and of references to the past delivered by these projects. However, we see them as local, situated redeployment and rearticulations of a general "mobile revolution" in a context relative to the underdevelopment of Poland, and to the particular social context of the post-state socialism condition. Thus we see location-based media and new technologies in current Polish cityscapes as a form of modernism of peripheries. On the rims of the modernizing world the process of social or technical change always differs from that of the center. Border territories of occurrence of a given phenomenon are usually a field of tension, a test area were things not easily noticeable elsewhere appear in daylight. There is neither place nor need to raise the disputes about modernization and even try to include in this analysis this huge subject filed. What is worth mentioning is the general turn in thinking about modernities towards local, peripheral and idiolectal issues (from extended literature on pluralization of modernities see for example: Appadurai, 1996; Augé, 1995; Eisenstadt, 2000, Majewski, 2009). Looking back on the historical period of industrial modernization in Poland, what was happening can be described as a kind of modernism of peripheries (understood as a situation when the cultural exchange balance is minus, when more is taken than given in the cultural circuit between countries or regions (Jedlicki, 1999, see also Berend, 1984 and Kula, 1983). However, we believe the process was not exactly the cultural complex which Marshal Berman called modernism of underdevelopment (Berman, 1983). In contrast to his depiction, it was not always a cultural imaginary which preceded a socio-economic change. The region was situated relatively nearby the core, and changes taking place in some regions were as intensive and progressive as in the core regions (as in nineteenth-century industrial cities with extreme rapid growth rates such as Lodz and Zyrardow). Nevertheless, after the material layer of development, the cultural superstructure did not follow. Consequently, a pure symbolic substitution of modernity did not (and did not have to) appear – the material and technical base was simply more modern than the culture accompanying it. At the same time, culture could not become a surrogate of the still partial modernity (somehow paradoxically, industrialization could be implemented rapidly, but modern culture not). Therefore, what Berman suggests for the rest of the tsarist empire, which Poland at this time was mostly a part of, was not the case: "the modernism of underdevelopment is a force to build on the fantasies and dreams of modernity, to nourish itself on an intimacy and a struggle with mirages and ghosts" (Berman 1983). Nevertheless, in some sense it is contemporary Poland which is undergoing precisely this type of modernism of underdevelopment, and it is possible to consider new media projects implemented in Polish cities as Berman's surrogates of modernity. Marek Ziółkowski aptly called such a situation imitative modernization/transformation, always a step behind, copying patterns from the center (Ziółkowski, 1999: 41) and compulsively trying to keep up with it. In this context, we propose to look at some peripheral uses of location-based media to investigate particular forms of epidermal modernization through technology. We also believe that a particular redeployment of technology can provide universal insights into the cultural contexts of technology. In the scientific field of media and technology studies what is usually considered as most interesting to analyze, research and observe is the vanguard, the core of change (also somehow in Wallerstein's sense, see 2004), the center of development. Notwithstanding, we assume that verification of the ideas in practice often takes place not in the center, but on the peripheries. Therefore, we decided to focus precisely on Poland to examine located-based media uses and projects in a broader cultural context, especially concerning the subsequent consequences for human experiences of space and imaginary struggles of being modern. We chose some examples of such uses in various cities in order to scrutinize a selection taken from a set of the most recognized projects which drew much attention of the local media in the period 2008-2011. We especially focus on one of them, namely the city of Lodz, as most emblematic of the peripheries, where the processes mentioned above are strengthened by the city's industrial character and its structural problems after the year 1989 (which we elaborate on later). Data mining for this study was a combination of unstructured qualitative research methods. A bundle of techniques, both ethnographic and stemming from discourse analysis, (such as participant observation, textual analysis, mapping and tracing the interconnections of involved actors and factors, following processes of implementation of location based media and related media, and cultural response) was used to generate an extended and diversified data resource for further scrutiny. In particular, worth mentioning are: participation and observation in five different, major place branding and tourist fairs in Poland (where such technologies were presented)  , extended query of journals dedicated to the local administration or issued by it as an official communication tool, participation in branch conferences on mobile marketing, extended studying of reports on mobile and location-based technologies and place branding, and long-lasting tracing of implementations of different solutions in the field of study (through the press, unstructured, informal interviews with entrepreneurs and local administration staff, and others). These data were supplemented by an internet query around such search items as "geolocalisation", "smartcodes" and other related terms (in Polish) to pick up interesting points of entry for further scrutiny. Thus, the method could as well be referred to as a theoretically-saturated, situational (Clarke, 2005), multi-sited, ethnographic analysis of the cultural context of the media (see Falzon, 2009; Marcus, 1995). Subsequently, all the data were subjected to a qualitative, hermeneutical analysis in search for their cultural meaning. Every cultural text, product or enunciation, such as a speech act, was treated as a symbolic act (Burke, 1973), bearing a broader cultural meaning and significance which could be traced and exposed in the research process. Following Ricoeur, we draw on two modes of interpretation, intermingled in a dialectical bond, namely demythologizing and demystifying an element. While the former is connected with empathic engagement with a text (and indirectly, its author), the latter is a one of suspicion, where we seek to identify a meaning not clearly visible, beneath a text's direct, literal meaning (see Ricoeur, 1970). Following this path, we attempted to read and interpret these symbolic acts in the broader cultural complex of Polish modernization, understood as an actually existing process of technological, infrastructural, social and cultural change, as well as a prevailing discursive theme in debates defining contemporary identity and the aims of politics. The challenge of a bricolage-like cultural analysis of this specific entanglement of technology and cultural acts, institutional contexts, and broader cultural processes which are not reducible to a subjective interpretation of the actors, begs for a suitable language of description. Therefore, we decided to draw on Frederic Jameson's peregrinations in the critical theory of late-capitalist culture. It offers a not reductionary depiction of cultural acts, exceeding subjective self-description, not simultaneously sliding into a hyper critical, marxist-critique-of-idelogy-like mode of reasoning. Moreover, it enables also to express the inner truth of consumer happiness which seems a not irrelevant dimension here. Frederic Jameson, an American cultural critic with rather unveiled Marxist inclinations, has proposed an interesting way of conceptualizing cultural phenomena and artifacts. He argues that a cultural investigation should be done in reference to a broader context of social totality, integrating economic, cultural and structural factors. Tracing the comprehensive socio-cultural relations (which he does not hesitate to call a mode of production), he tries to reveal a "deeper" meaning of cultural artifacts and practices. According to Jameson, the whole post-modern culture (Jameson 1991, 1998) is not only an effect or a symptom of late capitalism, but also a sublimation bringing a suppressed and controlled releasing of its contradictions, thus facilitating its further existence. Furthermore, culture is a form of neutralization of hidden desires deposited in the collective unconscious. The role of a cultural critic is similar to that of a psychoanalyst or archaeologist – he or she reveals cultural contradictions concealed in the "political unconscious" (Jameson, 1981). On the epidermic level of culture, different frictions and tensions could be observed in a displaced form. They are expressed in various texts of culture (in the broadest sense), or as Jameson puts it, after Kenneth Burke, in symbolic acts (Burke, 1973, Jameson, 1978). These artifacts should be comprehensively and dialectically investigated, and their relations with the social totality and internal structure ought to be sought (Jameson, 1981). Such a symbolic act is not a direct representation of a contradiction; nevertheless, it is constantly connected with it. The structure of this relation is somehow "psychoanalytic": a form of symbolic satisfaction is a displaced reaction for the contradiction (see Kuźniarz, 2008). It is an expression, as well as a neutralization, aimed at fulfilling intolerable, impossible, but inherently unavoidable desires, which could be immediately silenced at most by a surrogate of satisfaction (Jameson, 1992). A cultural text (Jameson is a literary critic, but he generalizes this way of reasoning for almost all cultural phenomena) is a focal point of various social bonds, institutions and power relations, which expresses a state of collective unconsciousness and reveals cultural contradictions on various levels (Kuzniarz, 2008). Also, location-based media and their role in the real and imaginary modernization of Polish cites can be seen as such a cultural configuration. We propose to investigate them precisely as related to a broader structural configuration, containing economic and cultural factors. In our view uses of technologies and their discursive presence (in the media, in struggles for identity, and in the marketing of Polish cities) are not a contingent element of economic and technological development. On the contrary, they are rather an expression and re-presentation of certain cultural contradictions and frictions. Thus, they are nothing less than symbolic acts of Polish modernization. The mobile revolution was only possible because of earlier trends of Web 2.0 and a general increase of user participation in data creation (Lapenta 2011). A transformation from top-bottom communication to bottom-top has prepared a subsoil for mobile solutions, which user engagement is an indispensable condition for. While observing what is happening with data production, it is easier to agree with optimistic prognoses of Web 2.0 consequences, such as Paul Levy's collective intelligence (Levy, 2000) or Howard Rheingold's (2002) swarm intelligence, which to some extent have come true. Alarming voices of techno-skeptics like Neil Postman, Clifford Stoll or Andrew Keen seem to be in retreat. The collective intelligence, the folksonomy, or other forms of user-generated content, if only not taken for scientific, fully reliable knowledge, are crucial for modern culture. They influence the urban landscape as well, just to mention concepts gathered in the influential book Technocities (Downey, McGuigan, 1999) or concepts of citizen plug-in (Nawratek, 2008). It is geolocation which also constitutes one of the most important streams in present technological change and in the turn towards the final user as a contributor, being directly related to urban landscapes and experiential frameworks of the city-dweller. As A. de Suoza e Silva and D. M. Sutko argue, for location-based media the most constitutive properties are: overcoming of the division between virtual/reality, creating a clear articulation between the physical and the informational, and constructing a close dependency of practices and user interaction (de Souza e Silva, Sutko, 2010). Geolocation, being a part, or a gate, to augmented reality, cooperates with GPS, compasses and gyroscopes. It is not a virtual reality, as it does not create a brand new fantastic world, but complements and extends the real one. That is why Lev Manovich decided to propose the term augmented space (Manovich, 2003). Our experience is not dominated by virtuality in an alternative world, it is only augmented – we are still present, conscious of the real space around, but with new additional virtual elements; it is a kind of a hybrid space (de Souza e Silva, 2006) . -a mobile revolution: mass usage of smart-phones and tablets, a flood of mobile-based applications and other media solutions available for the most common private devices. -and last but not least, the most "fancy," at the moment, role of geolocalisation: LBS, GPS, IP localisation, POI, etc. The first and the second dimensions were diachronically successive, and the third one is in some way a subsequent result of the other two. Without a doubt, geolocation has its five minutes of fame, specially the so called LBSNs (Location Based Social Networks) which are in a popularity kick. The rapid increase in the number of location-based or smartcode supported applications, the fast developing wi-fi infrastructure, as well as the falling prices of mobile Internet and general data transfer have reached Poland as well. Mobile phones certainly have changed from simple talking machines into multifunction, multimedia communication platforms. For instance, in Poland there are over 54,9 (2013) million active SIM cards (and 38,5 million of inhabitants, which makes 142,3 active SIM cards for every 100 citizens at the beginning of 2013) and optimistic prognoses assume that already one third of active mobile phones are smartphones, devices able to participate in geolocation projects (tablets and netbooks are another large group). This is just a part of wider processes, a "mobile revolution". Our phone has become the most important source of information about the world – material and virtual. It explains the modern world to us, helps us to orient in reality, reads space, decodes culture, and also traces our every move (Negroponte 1996, Katz&Aakhus 2002), preference and choice. It becomes our best friend, who knows and remembers everything, and advises and supports us at any time. A complex deployment of material and discursive factors, as well as multimodal relations of forces and interests shape the frames of development of geolocation technologies in Poland. Three main types of actors are active in this process: (1) local governments, city councils and the public sector; (2) entrepreneurs and business; (3) non-governmental organizations and informal social groups. An additional factor, which structures the frame of these actors' activities, is the European Union's system of funding and supporting innovative solutions in newer member regions. In last few years Poland was one of the main beneficiaries of EU-funds, and the influence of programs like Innovative Economy or Regional Operational Programs was significant. What is more, in Polish cities the most visible actors are not entrepreneurs, but local governments and the NGO sector, and the role of both has been getting stronger in recent years, empowered on the local political level. Business is present mainly as a ready-to-use solutions provider (often global, however the tendency in Poland is to prefer local Internet trademarks (Krejtz, 2010), as for example: software for decoding smartcodes - I-nigma, application for augmented space – like Geopedia, Where, Layar; or as a subcontractor for some specific implementations. Local governments and activists produce different projects, from the most entertaining/ludic-like location-based mobile urban games, to more formal projects like official tourist information systems. Business is more important on a discursive level, where the aforementioned marketers produce a discourse of compulsory modernization and a technology-enthusiastic apology for new media. Moreover, it shapes the particular solutions that are introduced. Marketers and PR-specialists dealing with new technologies already announced the mobile revolution, and what remains is to keep up with the tide. Without a doubt, we are witnessing a rapid change in everyday experience, especially the experience of being-in-the-city, as this kind of space is the most augmented by new geotechnologies. As the latest statistics show, geolocalization is most popular in the biggest cities in Poland, while supported mostly by middle-sized ones or, as in case of Lodz, those without a stabile identity and symbolic position. Some information systems were built on Layar, described by its provider as a"...Reality Browser [which] shows what is around you by displaying real time digital information on top of the real world as seen through the camera of your mobile phone". Everyone can add his or her data to the map. Nothing is easier than to built your own "layer", which was done by the city of Katowice (Pezda, Malinowska, 2010), gaining all the primacy of being the first Polish city with Augmented Reality. The Layar works like a reality scanner. Looking through a phone display one can see a geographical grid and a mini-radar, with all the preselected groups of objects. In the year 2011 a tourist layer was supposed to be created for Lodz (a post-industrial city in central Poland and the third biggest in terms of population with around 700 000 inhabitants), but works were abandoned because of the city's debts. This project was to be the continuation of a mobile tourism information system called "Decode Lodz", which was highlighted as the first tourist information system in Europe based on smartcodes. Smartcodes are a new generation of graphic codes operating in two dimensions; therefore, their other name is 2d codes (but also QRcodes or photocodes), and they can be also seen as part of Augmented Reality. By using them one can encode not only numbers, but also other alphanumeric characters. Thanks to this, smartcodes can become a link to the virtual world, a combination of the real object and content related to it which appears on the Web. In practice, this brings immediate specific information tailored to a certain place. 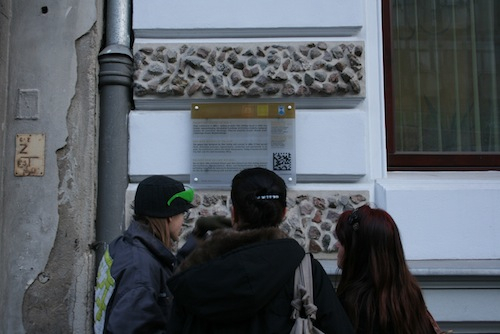 In Lodz, more than 50 historical buildings received smartcode plates. After scanning one of them, a user is transferred to a mobile webpage, gaining access to information about the monument. Moreover, potentially, smartcodes may also provide more complex commands for mobile devices, using GPS capabilities and so on. Currently, the most extensive system, based on different location-based solutions, was made in Wodzislaw Slaski, a small city in South Poland with about 50 000 inhabitants. The local tourist information system is based on smartcodes located on the most important monuments, on intelligent kiosks delivering tourist and cultural promotions of the city (including the transfer of certain information to a mobile via Bluetooth), as well as on quite classic website and mobile applications containing tourist and cultural information. In 2011 an almost identical system was built in nearby Rybnik and Zory (the same region, similar amount of inhabitants). Figure 3. A park in the city of Wodzislaw Slaski. Furthermore, Polish companies are working on another novelty, the GPS audio-tour for car use. As we drive, the GPS system, in addition to the information about the next crossroads, will also show nearby interesting places and will say a few words about them. Another futuristic project, but one likely to become common, is a simple mobile application, created by students from the Technical University of Lodz, that distinguishes objects from the real world by shapes. While we scan the space around us with a mobile, recognizes shapes or configurations of shapes saved in its database. In practice it means recognition of, for example, a logo or a monument, or even an architectural style of a particular building. The natural consequence of all this is to think about an omnipotent system, both inclusive and selective, which can accomplish all of these possibilities. Therefore, one should ask if all these phenomena and their particular implementations, the many uses of location-based media, are only simple outcomes of technological development or if they mean something for, and indicate something about, a broader cultural context. Thus, we look for theoretical critiques of culture which could help us to read these uses of geolocation media in a cultural-context way. These theoreticians of media are not always recent ones, as we are concerned that every cultural phenomenon should be scrutinized in a broader frame, not reducible to the here and now. All the aforementioned cities struggled with a post industrial heritage and "wounded identity" (Salm, 2006, Kloch, 2005). Rybnik, Zory and Wodzislaw are small towns of the Silesia region, while Katowice is the capital of it. Whereas Silesia was a well-developed heavy industry center, Lodz excelled in the textile industry. Both branches collapsed after 1989, leaving these cities in deep crises for the next decade. Problems with creating new economic and cultural development and, on a symbolic level, a new identity were in our opinion crucial factors inducing investments in new technologies. They posed a means to accelerate, or just substitute for, the desired but lacking development, especially in the context of modernization as a main, hegemonic signifier organizing Polish political and regional discourses. Therefore, we focus on a broader frame of cultural tensions and contradictions which Polish cities (or maybe the whole cultural configuration split between regressive traditionalism and compulsory, mainly infrastructural, superficial modernization) cope with. Indeed, this broader focus is also a way out of some futile, inner media studies debates and possibly a way to shed new light on the field. Paths of development, deployment of factors and actors engaged in the development, and, last but not least, the cultural significance and the role which technologies take on the level of collective consciousness are not an outcome of contingent processes, but are interconnected with a kind of historical situation, over determined by a network of structural relationships in the social totality. All these technologies, their implementations and uses, play a specific role in a broader cultural and institutional field of Polish modernization processes. Perhaps this role should be carefully examined considering the importance of new technologies as an imaginary factor of modernity. As infrastructural projects in smaller towns have been already partly realized, now the informatization, innovation and new technologies can come to the agenda. Poland was and is the biggest recent recipient of funds from the European Union budget; the sum of donations in the period 2004-2010 was about 32 million euros (that is almost 1000 euros per citizen). We can read on the official governmental website that "since the start of programmes until July 2013, 268 300 applications (correct from the formal point of view) were submitted for the global amount of co-financing (both Community and national funds) of 548.5 billion Polish zloty"(http://www.funduszeeuropejskie.gov.pl). The second biggest group of beneficiaries, after agricultural concerns, is local governments. A significant part of these funds are spent on new technologies, among them location-based media. The present situation is defined by previously unbelievable financial possibilities provided by EU grants and state government development funds. The application process is not very complicated, especially with the expert support provided by companies interested in selling particular solutions. EU subsidies managed by local development agencies are granted to public administration units, which, not so rarely, delegate the whole task (and money) to private companies. Outcomes are spectacular, measurements are met, articles in local newspapers are enthusiastic, and official openings are exciting. Only if the project is really well designed and useful will some other people benefit. Unfortunately, this is not a rule; further development and keeping the implementation functional and attractive for ordinary users often fail. This situation gives us an opportunity to ask what is the deeper cultural role of geolocation media in Polish cities, considering particular institutional conditions, which artificially feed this development. The main task of promotion departments, tourist centers, and PR teams in city councils is constructing and disseminating the identity and public image of the city, both for the city dwellers and potential investors and tourists. Technologies and services seem to be important precisely in this field, rather than realizing the practical needs of users/inhabitants. What "questions posed by [the] situation in which they arouse" (Burke, 1973) do these symbolic acts answer? Symbolic acts here mean concrete, localized investment and implementation decisions covering geolocation media in Polish urban landscapes. Why was the early and spectacular initiation of these solutions so important for Polish city councils? What does this indicate about the Polish "urban"? Jameson has pointed out the role of "the urban" in postmodern identity. Of course modernism and modernity were par excellence urban. But it is the cultural logic of postmodernism which is based on acclimatization to and generalization of the urban as a form of life, as well as an indicator of contemporary cultural identity. This logic has also generated specific problems emerging from the impossibility of relating to otherness, an impossibility which negatively supported our own identity, and confirmed our identification and our adherence to modernity. "The modern still had something to do with the arrogance of city people over the provincials, whether this was a provinciality of peasants, other and colonized cultures, or simply the precapitalist past itself: that deeper satisfaction of being absolument moderne is dissipated when modern technologies are everywhere" (Jameson, 1998). Katowice, Lodz Rybnik, Wodzislaw Slaski or Zory (cities in Poland, big but sometimes underdeveloped or middle sized) are not only examples of effective searching for EU funds or attempts to make the most of the media boom and professional prosperity. What they are participating in is a great struggle for defining provinciality. Somebody who utilizes the newest geolocation technology, could not be classified as such. Introducing smartcodes in the damaged and not sufficiently financed center of Lodz is a magical act repelling real shortages and challenges. New technologies create imaginary satisfaction. Structural, post-transformational poverty, urban sprawling and lack of infrastructure are severe problems not possible to solve without sufficient funds. An innovative geolocation system is not so expensive but far more spectacular. Furthermore it helps to construct a modern symbolic identity and wage a battle for a modern public image. Moreover, it is not just that these enterprises are only a symbolical substitution for modernity, and a distorted symptom of chasing the modern from a peripheral and underdeveloped position. It is even more the matter of the local, peripheral "run" on the imaginary level by Polish cities. It is another way to create a desired, alternative, inner distinction from the non-modern, which is not easily available outside the center. "[T]here are no longer any provinces, and even the past comes to seem like an alternative world, rather than an imperfect, primitive stage of this one" (Jameson, 1998). The past finds also a peculiar place in geolocative media content, really and immediately becoming an alternative present. In Decode Lodz, barcodes refer us to archival photographs and sounds. 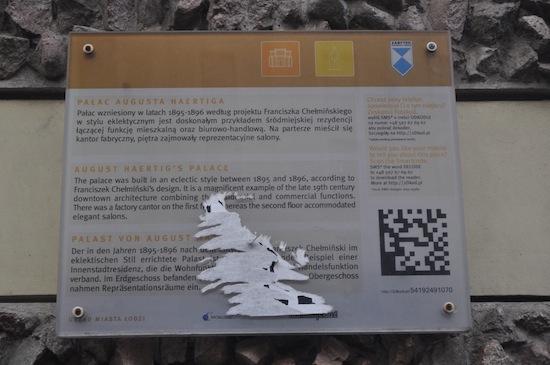 Layar can project on the physical space its past appearance – present a damaged synagogue or long ago disappeared seventeenth-century docs, guide us though the existent city changed into the alternative present of the past. Augmented reality gives us an opportunity to "embed" virtual objects, such as the mentioned historical buildings, into real space, and the same applies to other artifacts or avatars. On a smartphone display, the surrounding urban space is turned into open air museum; the user defines the epoch, topic, or even the scenario for the course of past events. The interference of different streams of imaginary modernity, identity self-struggles, and removing the past and reducing it to the alternative virtual world augmenting everyday life have become important elements of the Polish urban, or maybe they have become the whole experience of the present in semi-peripheral late capitalism. Moreover, complicated present relationships with Polish history also find an expression here. The twofold dynamic of remembrance and forgetting, the intertwining of shallow patriotism and the impossibility of reworking our own history correspond perfectly with reducing the past to, on the one hand, theatrical battle reconstructions, and, on the other, electronic guided tours evoking pompous feelings. Consequently, the past as alternative presents, 'live' decorations of augmented space, and superficial contact with reduced, 'epidermal' history do not disturb the collective conscience and at the same time satisfy the need of past-oriented national identity. This is a fallen form of modern, civil patriotism. This collective self-confirmation has an individual parallel in the substitutional mapping of social relationships by technology-based solutions, which provides navigation in a multidimensional contemporary world escaping easy subject conceptualization. Regardless whether we put under scrutiny LBSN services, geolocation applications, or smartcodes in tourism, we can distinguish two key moments: (1) conferring a surplus dimension on urban space – constituting augmented space and rendering additional content deployed in the real space; and (2) locating the user not only in an artificial configuration, but also by material and real reference in space allowing the user to cognitively map the world around. The first aspect creates an individually configured, personalized, "subject-centered" world, the nucleus of which is always occupied by the user who defines the particular features of this world. The second situates the user in an "objective", existing space, thus gaining an inter-subjectively recognizable place in it. Both aspects interfere and constitute a kind of "paranoid" subject position of the user, whose world is taken for granted by a constructed "I", concentrating his/her whole knowledge and experience (see Roberts, 2001). The multifunction phone accompanies us in every single moment of our existence; it becomes a kind of subjectivity extension. Already equipped with technologies mediating social experience, the phone is now also a geolocation appliance mediating the topographical experience. It saturates our sensory universe with an additional layer of meanings which we utilize in various manners. It provides a substitute cognitive mapping (Jameson, 2000), which has been lost in the multidimensional social space of late capitalism. As we cannot clearly refer to our location in social space and embed ourselves in the totality of social relations, we are tremendously looking for rooting ourselves at least in the physical space of the city (bear in mind that the city is a main frame of reference of existential experience for the urban dweller, and the city is the very archetype of political collective!). Thus, geolocation technologies situate us in space – in its "real" physical sense - by indicating our position on a map, as well as, on a more metaphorical level, supplementing our subject self-coordinates. This said, we can relate to the local context. The post-transformational public sphere, with its peculiarities, does not give a sufficient frame of reference for collective political action. Real-socialism, a social void, and the lack of intermediary institutions between the state and individual have been filled by satisfying private needs and material interests, removing the political dimension from everyday experience. Moreover, anti-political attitudes have been strengthened by the discursive suturing of the political sphere with official state socialism. Dissident circles and oppositional political languages looked for legitimate collective activity in civil society, as opposed to the state. Consequently, deeply anti-political attitudes were created, perfectly conjoining with the post-political governance of neoliberal states. The weak civil society, if present, was rendered as counter-political, and the alienating condition of being was self-reduced to the economic sphere (in both meanings, the home and company management) producing a "political unconscious" (Jameson, 1981) which seeks a displaced satisfaction in new, technological sociality, and new kinds of imaginary bonds with locality. A significant share of the supply of content for geolocative media (state and private, centrally designed, and user generated) is historical and local in character. The general pattern can be referred to as a "describing the space" paradigm, aimed at offering, reminding, and evoking particular meanings which saturate the surroundings of the user. Tourist information, after "memory boom" (Winter, 2000), consists of memories, histories from below, and private narratives instead of official facts. Thus, it targets emotions by confirming the feeling of domestication or rootedness, helping us to recognize the space. It does so with a foreigner who is told about his/her new surroundings as well as with an inhabitant who can better integrate him/herself with a place of residence (this goal is the explicit, main aim of some projects, like Decode Lodz). Thus, it constitutes a new mode of situating the subject in space. A mobile phone – a gate to augmented reality – situates us in various ways, not only in a physical location, but as a clear marker of a place in the social structure (not limited to a sign of prestige as the newest, expensive item or sign of a particular life style). LBSN services allow us to integrate the physical coordinates of an individual with the "social" one, a position in the social network, with digitally transformed personal relations represented by "bubbles" appearing on a phone display. The phone is not only the subject extension, but an apparatus which we reflexively read ourselves from. It is a king of technological "looking glass self", to refer to Ch. H. Cooley. Whereas earlier we were able to verify our social relations by a quantity and quality of Facebook contacts and a set of used applications and devices, now the process is enriched by a spatial dimension and the mobility of a new medium. The quality of one's sociality is represented by a number of entries to a homepage, or markers on a map (regardless whether they substitute or facilitate real encounters). These services are no longer bound with our laptop or PC; they accompany us everywhere. Moreover, our day agenda can be systematized and evaluated by organizing an application and effectively executing its schedule; whereas a consumer profile is defined by a market advice service based on users' opinions. Simultaneously, a smartphone can display real-time weather conditions, helping us to choose clothing, and biometeorological conditions which define our mood, and so on. Our subjectivity has been objectified, "we read our subjectivity off the things outside" (Jameson, 1998). Our identity as modern and urban is rendered by such objects and technologies in countless ways. Therefore, it leads to the suspension of the subject-object dualism, as both its sides are merged, not so rarely under a rule of the latter. Our subjectivity has been deployed in objects. Location-based technologies are not only a standard and unproblematic element of technological development. Their importance should not be reduced to everyday functionality or the lack of it. Uses of media, by final users as well as by NGO's and city councils, should be carefully scrutinized in relation to institutional context, and, what is probably most interesting here, considered as embedded in the broader cultural dynamic of imaginary modernization. The struggle for the "modern" identity of the Polish city and a general "modernism of underdevelopment" in its 21st century avatar evoke strong contradictions and frictions. Consequently, they generate symbolic acts providing an appropriate collective consciousness of being modern, and, last but not least, of being urban. A broader discussion engaging citizens as well as touching on more severe problems about Polish modernization has not been commenced. Progress is unproblematic, and self-evident category, not considered as a complex and contextualized idea, which should be a matter of political reasoning and decision. Local councils' strategies and regional policies are also affected by this problem. Thus, these symbolic substitutions establishing imaginary modernization should be seen in this context. It is not to say that related aspects of modernization should be entirely condemned, but rather that one should problematize them in order to be more aware of their cultural background. Of course the "mobile revolution" is an universal phenomenon, bringing about the re-framing of spatial experience and new kinds of electronically mediated sociality. In the peripheral context of modernization it takes on rather vernacular and idiolectic shapes, which can be seen as indicators of deeper frictions of modernizing consciousness. All these raw comments are rather of a "sensitizing" value, evoking a heuristic potentiality at best. What is most striking is the possibility of a "symptomatic reading" of geolocation media usages, going far away from obvious matters of fact. This reference to broader cultural and structural contexts relating to institutions and deeper layers of cultural needs, allows us to contextualize these technological solutions in ways different from the usual research paths focusing on technology on one side, and on relationships with the human perception apparatus on the other. Geolocation could appear as a significant factor in shaping new kinds of subjectivity, not only on the individual-cognitive level, but also in relation to broader social structures. As an important factor in the imaginary modernization of peripheries, media uses can be examined as discursive and cultural phenomena, enabling a kind of partial hermeneutic of modernization. Berman M. (1983): All that is solid melts into air: the experience of modernity. London, New York: Verso. Bloom H. (2000): Global Brain: The Evolution of Mass Mind from the Big Bang to the 21st Century, New York: Wiley. Burke K. (1973): The Philosophy of Literary Form, Berkeley: University of California Press. Clarke, A. (2005). Situational analysis: grounded theory after the postmodern turn. Thousand Oaks, Calif: Sage Publications. Eisenstadt S.(2000) Multiple modernities, Daedalus; Winter 2000 129, 1-26. Jameson F. (1981): The Political Unconscious. Narrative as a Socially Symbolic Act, New York: Methuen. Jameson F. (1992): Signatures of the Visible, New York: Routledge. Jameson F. (1998): The Cultural Turn. Selected Writings on the Postmodern 1983–1998, London, New York: Verso. Jameson, F. (2000): Cognitive Mapping, In: Hardt, M., Weeks, K. (Eds. ), The Jameson Reader, Oxford: Blackwell, 277-287. Jedlicki J. (1999): A suburb of Europe : nineteenth-century Polish approaches to western civilization, Budapest: Central European University Press. Katz J. E., Aakhus M. A. (2002): Perpetual contact: mobile communication, private talk, public performance, Cambridge: Inoiversity Press. Kloch B., Stawarz A. (ed.) (2005): Tożsamość społeczno-kulturowa miasta postindustrialnego w Europie środkowej, Rybnik-Warszawa. Muzeum w Rybniku i Polskie Towarzystwo Etnologii Miasta (in Polish). Kula W. (1983): Historia, zacofanie, rozwój, Warsaw: Czytelnik (in Polish). Kuźniarz B., Trzy opowieści z krainy późnego kapitalizmu. Krytyka Polityczna 16/17, 196-213 (in Polish). Lapenta F. (2011), Geomedia: on location-based media, the changing status of collective image production and the emergence of social navigation systems, Visual Studies, Vol. 26, No. 1, March 2011. Levy P. (2000), Collective Inteligence: Mankind's Emerging World in Cyberspace, Perseus Books, Harmondsworth. Majewski T. (2009) Modernizmy i ich losy, in: Majewski T. (Ed. ), Rekonfiguracje modernizmu, Warszawa: WAiP (in Polish). Manovich L. (2003): The poetics of augmented space, In: Everett A., Caldwell J.T. (eds), New media. Theories and practices of Digitextuality, New York: Routledge. Marcus, G. E. (1995). Ethnography in/of the World System: The Emergence of Multi-Sited Ethnography. Annual Review of Anthropology, 24(1), 95–117. Nawratek K. (2008): Miasto jako idea polityczna, Kraków: Korporacja Ha!art (in Polish). Rheingold H. (2002), Smart Mobs. The Next Social Revolution. Transforming Cultures and Communities in the Age of Instant Access, Basic Books, Cambridge. Ricoeur, P. (1970): Freud and Philosophy: An Essay on Interpretation (trans. D. Savage). New Haven, CT: Yale University Press. Roberts A. (2001): Fredric Jameson (Routledge critical thinkers), Taylor & Francis e–Library. Salma J. (2006), Zderzenie dwóch światów. Tożsamość to wielobarwny palimpsest. Kronika Miasta Łodzi 1/2006 (in Polish). de Souza e Silva, A. and Sutko, D. M. (2011): Theorizing Locative Technologies Through Philosophies of the Virtual. Communication Theory, 21(1), 23–42. de Souza e Silva, A. (2006): From cyber to hybrid: Mobile technologies as interfaces of hybrid spaces. Space and Culture, 9(3), 261–278. Surowiecki J. (2004): The wisdom of crowds: Why the many are smarter than the few and how collective wisdom shapes business, economies, societies, and nations. New York: Doubleday. Winter, J. (2000): The Generation of Memory: Reflections on the Memory Boom in Contemporary Historical Studies. Bulletin of the German Historical Institute 27, Washington 28 (2000), 80-82. Ziółkowski, M. (1999) O imitacyjnej modernizacji społeczeństwa polskiego. in: Sztompka P. (1999) (ed.) Imponderabilia wielkiej zmiany: mentalność, wartości i więzi społeczne czasów transformacji. Warsaw: PWN (in Polish). Graham, Paul (2011), Web 2.0, source: http://www.paulgraham.com/web20.html; (20/10/2011). Howe J. (2007A): Crowdsourcing. Why the Power of the Crowd Is Driving the Future of Business, Crown Business, source: http://crowdsourcing.typepad.com/cs/2008/06/chapter-8-the-i.html (20/10/2012). Howe J. (2007B): The Rise of Crowdsourcing, Wired 17th of march 2007, source: www.wired.com/wired/archive/14.06/crowds.html (20/10/2012). KPMG Report, source: http://www.kpmg.pl/index.thtml/pl/about/wydarzenia/Informacje_Prasowe/index.htm l?cid=52616e646f6d4956c9e3480ba1e950f1e92b77f8fbfe51f5 (20/10/2012). Krejtz K. (2010): Mobilność 2010 - raport o wpływie internetu mobilnego na życie Polaków, SWPS, source:http://www.egospodarka.pl/pliki/Raport-Mobilnosc-2010.pdf (20/10/2012). Kultur@lny Wodzislaw Project, source: http://www.kulturalnywodzislaw.pl/pl-def/cms/projekt (20/10/2012). Mobile Exposure 2010, source: http://reklama.wp.pl/get,42,Mobile–Exposure–2010–Fakty–Polska,wiadomosci.html (20/10/2012). Pezda A., Malinowska A.: Katowice – rozszerzamy rzeczywistość. Gazeta Wyborcza 14/09/2010, source: http://wyborcza.biz/biznes/ 1,100896,8372118,Katowice___rozszerzamy_rzeczywistosc.html (20/10/2012). Seabird by Mozilla Labs: http://www.youtube.com/watch?v=oG3tLxEQEdg (20/10/2011). Sixth Sense Technology TED, source: http://www.youtube.com/watch?v=fQEHtvNsfKE&feature=related (20/10/2012). Zetto K.: TED: MIT Students Turn Internet Into a Sixth Human Sense. Wired 05/02/2009, source: http://www.wired.com/epicenter/2009/02/ted-digital-six/ (20/10/2012). 17. Geolocation services in Poland, source:http://www.slideshare.net/krzochal/geolokalizacja-w-polsce-2012 (20/06/2013). These were among other: International Tourist Fairs Warsaw, Tour Salon, Tourist Fairs in Wrocław, RemaDays, Galeria Marketingu Miejsc in years 2008-2010. Such extended data mining and triangulations of method, techniques and data sources was possible due to the professional occupation of one of the authors, who used to work for almost two years in a privately owned company operating in the field with direct participation in many of the described processes. "Wired" in June 2010 called Dennis Colwey "The New King of Social Media" giving him the cover picture in a crown for creating the location based social- networking game Foursquare – this seems to be emblematic. As it quickly occurred, geolocation was over-emphasized, but a signal about the new trend was already sent from the center to the perypheries. http://site.layar.com/company/overview/products/ (20/10/2012), according to Layar producent in winter 2010 it was installed on over 1,6 million mobile phones. Wiktor Marzec is a sociologist and philosopher. His principal research interests lie in the field of social theory and political philosophy. Fields of studies thus far have been in the sociology of sexuality, cultural aspects of urban modernity and the social history of the city of Lodz. At present he works on the crossroads of labour history, historical sociology and political philosophy, and his main current research concerns intellectual emancipation and the articulation of political subjectivities among workers during the 1905–7 Revolution in the Kingdom of Poland. Currently he is pursuing a doctoral degree in sociology and social anthropology at CEU, Budapest . Agata Zysiak is a sociologist of culture and a local activist, currently a PhD student at University of Lodz (Poland), where she works on post-war modernization of science in Polish universities. Her main areas of interests are urban studies, social memory and historical sociology. Currently she is involved in a few research projects concerning biographical method, local debates about modernity and social history of Lodz. She works as well in a local NGO, gathering oral histories of Lodz's citizens.